So I'm on vacation in the North Woods of Wisconsin, in a cabin with two kids (I know you all are so jealous!) I had planned on taking the whole week off, which is why you have so far enjoyed the lovely Liz and the great Gretchen. Originally I was going to post my usual Wednesday Words of Wisdom today but the fabulous Princess Mikkimoto tagged me in a post and since it's for a great cause I decided to join in. 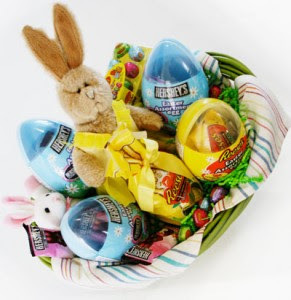 Hershey’s has partnered with the Children's Miracle Network this Easter to donate up to $5000 through the Better Basket Blog Hop campaign. If you want to participate also, it’s very quick and easy. Hershey’s will donate $10 per post up to 500 posts. When we are all done that will be $5000 raised for Children’s Miracle Network! * Leave your link at BetterBasket.info/BlogHop comment section. You can also find the official rules, and more information about Better Basket with Hershey’s there. I’m sending this Easter Basket to Erin and Claire. You can follow the giving on Twitter using hashtag #betterbasket. Thank you to Hershey’s for making a difference and giving us the chance to participate! YAY! good for you! Good for US! Hope you are having a wonderful vacation!